This small Balkan country is full of splendid highlights and discovering this cultural land by bike is an invigorating and enriching experience. Macedonia is simultaneously ancient and modern – stately Orthodox monks in their black robes amble alongside the fashionable elite in the stylish bars of Skopje. This tour is a true mountain bike experience with routes and trails to challenge the determination and the legs of those that love riding dirt. The daily rewards for your efforts are majestic: views that stop the breath and remain as visual reminders of Macedonia's sublime beauty, other worldly mountain villages with charming architecture preserved from a time past, an array of flora and fauna endemic to these unique Balkan mountains, and fresh as dew, clear as crystal glacial lakes that dazzle the mind. Our route climbs through a series of Macedonia's gorgeous ranges and we scale several imposing mountains over the course of our riding. Our first ride is to nearby Vodno Mountain, where a cable car whisks us up to the top, which is the base of the Millennium Cross. We then hit single-track trails and a quiet road to Matka Canyon. After a visit to the 14th century monastery of St Andreja, we transfer to Popova Shapka. Today's ride takes us into the mountains of Shar Planina on dirt roads close to the Kosovo border. We cycle into Leshnica Valley and overnight on the southern shores of Lake Mavrorov. We're now warmed up for a new challenge as we cycle through stunning Mavrovo National Park, home to Macedonia's highest peak, Mt Korab (2,764 m). Biking into the Bistra Mountains takes us alongside the emerald green Mavrovo Lake, with visits to villages such as Galicnik with well-preserved traditional architecture, including an amphitheatre. Transfer to our hotel in Ohrid. After a sightseeing tour in the morning enjoy the picturesque and relaxing setting of Ohrid, a UNESCO World Heritage Site, listed for both its cultural and natural attractions. We return with our bikes to the mountains, tackling the grand Galicica Mountain we pass through beautiful pastures and the bright floral life. Beautiful forests line our morning ride through Pelister National Park. as we head to the Big Lake, a glacial body of water. After lunch in Bitola, we transfer to Skopje for a farewell dinner of traditional fare. Our tour ends after breakfast, but you can explore Skopje. This is a challenging mountain biking tour and is for those who want to test their climbing stamina. We ride a total of 285 km and ascend 5700 m in just 6 cycling days! We ride primarily on dirt and gravel roads, as well as some single-track trails and a few sections of paved roads. Though the daily distances aren't long, the terrain and altitude will provide the challenge. We will be riding at 2,000 m on two days, making sure your lungs get a full work out. On this trip, we will be soaking up the natural highlights of Macedonia's mountains and lakes, which means we'll be riding in remote areas where vehicles can't always follow. Suitability: This trip is for those who are fit and have the stamina and endurance for sustained climbing. On some days, we'll have the option to shorten the riding distance and ascent if the terrain proves to be too much. The guide will offer this option during the tour. Biking Conditions: This tour follows a mixture of dirt roads, single-track trails, and gravel paths, as well as sections of tarmac. Off-road riding experience is required, though there will be no tricky technical sections. As in any mountainous region, the weather can also be unpredictable, so please be prepared for quickly changing conditions. A support vehicle will not be following us on all our rides. Some days we will meet up at points during the day, other days we will only see the support vehicle at the beginning and end of the day. We meet after breakfast for our first ride to nearby Vodno Mountain. A short transfer brings us to a cable car that will whisk us up to the top where we'll be at the base of the Millennium Cross, a 66-m high monument to 2,000 years of Christianity. We then hit single-track trails and a short ride on a quiet road to Matka Canyon, a popular outdoor destination for hikers and kayakers. The canyon is also home to several historic churches and monasteries. We stop for a visit to the 14th century monastery of St Andreja built by the son of the famous medieval King Volkashin. After lunch, we transfer an hour to Popova Shapka, a ski resort in the Shar Mountains to be well positioned for our morning ride. Today's ride takes us into the mountains of Shar Planina, where we follow dirt roads close to the border with Kosovo. We cycle into wild Leshnica Valley and discover a hidden paradise with astonishing views of one of Europe’s secret mountain regions. Over 44 species of game are present on this mountain including lynx, bears, and wild boar. Eagles, falcons, and hawks are also common and riding on dirt trails at high altitude will bring us close to nature. On our way back to the road, we ride by way of Ceripashina and the ski centre, then continue to the city of Tetovo. We take a short break for Turkish coffee and fresh squeezed juice and visit the Painted Mosque, unique in the area for its beautiful façade, before driving to our hotel in Mavrovo. After yesterday’s ride, we're warmed up for a new challenge as we cycle through the stunning Mavrovo National Park, home to Macedonia's highest peak, Mt. Korab (2,764 m). An ever-changing combination of asphalt, compact gravel, and dirt roads leads us through this fairy tale scenery of grassy meadows, birch and pine forests, snow-capped peaks, and the gorgeous Radika River. After a traditional lunch, we return to our hotel to relax. Biking into the Bistra Mountains takes us alongside the emerald green Mavrovo Lake, with visits to the villages of Nikiforovo and Leunovo. We continue off-road riding through green pastures dotted with ancient sheepfolds. We stop in one of those sheepfolds to try fresh cheese and pavlaka. We take a break at Galicnik to admire the well-preserved traditional architecture, including an amphitheatre. A long downhill through a forest leads to the village of Tresonche, where the way of life has changed remarkably little since the 19th century. We continue along the Tresoncehka River to Debar Lake, where we are picked up and transferred to our hotel in Ohrid. We take a well-earned day in the picturesque and relaxing setting of Ohrid. Notable for once having 365 churches, one for each day of the year, Ohrid is a UNESCO World Heritage Site, listed for both its cultural and natural attractions. In the morning, we tour the highlights of St. Sofia Church, Plaoshnik Complex, the Amphitheatre, and Tsar Samuel's Fortress. The afternoon is free to stroll through the alleys, swim in the lake, or just sit in a cafe and soak up the pure, unique delights of this rich, ancient town. Refreshed from a day’s rest, we return with our bikes to the mountains. Tackling the grand Galicica Mountain, we cycle through beautiful pastures and the bright floral life native to these slopes, as we ride under the shadow of Magaro Peak (2255 m). We stop for photos as we will have stunning views of Lake Ohrid and Lake Prespa. 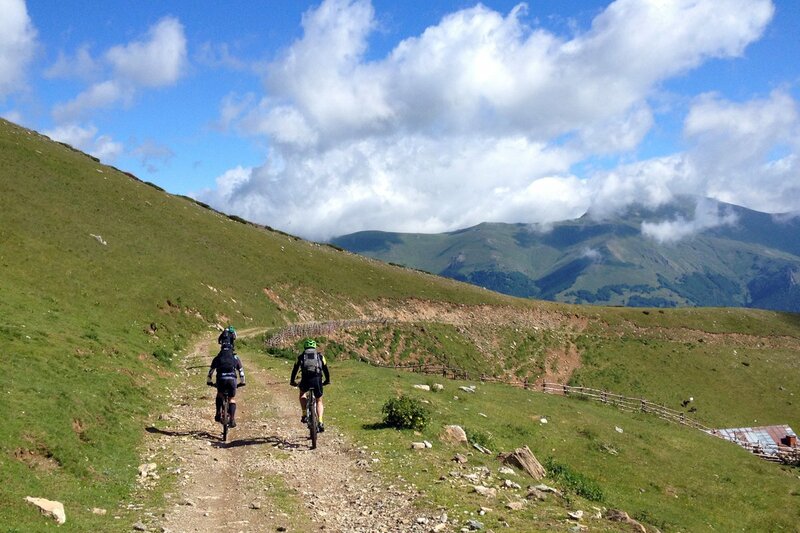 Then, as we begin our descent, we will enjoy a mix of off-road and backroad biking with some sweet single tracks. From Peshtani, we drive to the picturesque fishing village of Trpejca for lunch and try the famous Ohrid trout. We'll transfer to Pelister National Park where we overnight in the heart of the park. Beautiful forests line our morning ride through Pelister National Park. We cycle through a rich variety of flora, from beech and oak woods to numerous healing herbs and various fruit, including strawberries, raspberries, blackberries, and blueberries. Our route takes us through fabulous countryside as we head to the Big Lake, a glacial body of water, which, along with its smaller companion, are known as the Pelister Eyes. To get our daily ration of climbs, we'll ride to 2300 m, just shy of Pelister Peak’s summit. We will have an urban finish to our day with lunch in Bitola, Macedonia's second city, before transferring to Skopje to meet up for a farewell dinner of traditional fare. Our tour ends after breakfast. If time allows, you can explore the centre of Skopje before your onward journey. Because some people can't imagine going on a trip without their own beloved bicycle, we do not provide them as part of this tour. However, you can hire bikes locally for the price listed in the tour pricing section. The bikes are Corratec hard tail mountain bikes with lightweight alloy frames, 27-speed gearing, disc brakes, and Shimano components and front suspension. If you bring your own bike, please make sure it is a mountain bike, preferably with front suspension, in good mechanical order. Citizens of EU member states and of the signatories to the Schengen Agreement may enter Macedonia with a valid ID card issued by the competent authorities of the concerning countries. All remaining nationalities require a valid passport for entry into the country. Please ensure your passport is valid for at least 6 months from date of entry. If staying less than 90 days a visa is not required for nationals of more than 70 countries. Please check the Macedonian government website for details applying to your status. 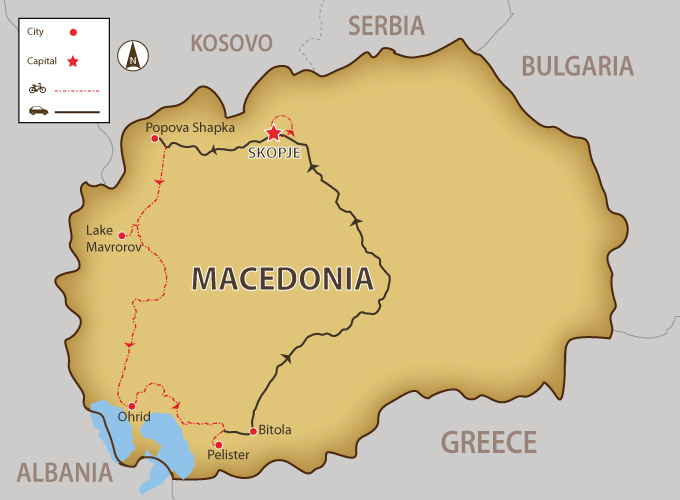 Macedonia generally has sunny and warm weather during the spring and autumn, dry hot summers and cold and rainy winters. May-October is an excellent time to visit, as it's the warmest and driest part of the year. July and August have the most sun and are the best months to visit the lakes. Average temperature in the summer is 73 F/23 C, but a sweater may be needed in the evenings and at higher altitudes. Please also be aware that weather in the mountains is unpredictable and can change quickly. Meals are included as per the itinerary where B = breakfast, L = lunch, D = dinner. Macedonian cuisine is noted for the freshness of salads and for its use of red capsicum and beans. Macedonian pastries are well-known and are extremely popular and eaten on a daily basis. We shall make sure you sample as much local cuisine as you wish. Any special dietary requirements can also be catered for as well. Please let us know at the time of booking. Keeping you completely hydrated is a job we take very seriously. Cold water, some energy-restoring local fruit and soft drinks are included in the tour price while riding. But you may also want to bring electrolyte in powder or tablet form. Soft drinks and other beverages during meals are not included. Alcoholic drinks are available everywhere, but are NOT included in the price. As Macedonia is an emerging tourist destination with limited hotel capacity there is a chance we may have to substitute listed hotels with ones of equal or higher rating. We will inform you of any changes in advance. We recommend that you tuck away a few extra euros/dollars for possible incidentals that might arise. It is always wise to have some paper currency in case of ATM absence or credit card problems. This will save you a lot of unnecessary worries. It is also customary to tip local tour guides and drivers; however, the amount you give should be dependent on the level of service you receive. As a general guide we suggest that Euro 4-5 per person per day is appropriate. Macedonia's currency is the denar (MKD) and is not convertible outside the country. Restaurants, hotels and some shops will accept payment in Euro (usually) and US dollars (sometimes). Small private exchange offices throughout central Skopje and Ohrid exchange cash as do the banks. ATMs can be found in all of the major towns and tourist centres but not in out-of-the-way places. Travellers cheques are a real hassle to change and we advise against relying on them, except as a form of emergency back-up money. Credit cards are widely accepted, but don’t take it for granted, even at a hotel or restaurant.